Drawing did not begin to occupy Jan Senbergs seriously until the late 1970s after he stopped screenprinting and had completed a major sculpture commission for the High Court of Australia. His first exhibition of drawings, 'Port pastels', was in Sydney at the Rudy Komon Art Gallery in 1979. Drawing has since remained central to his practice. 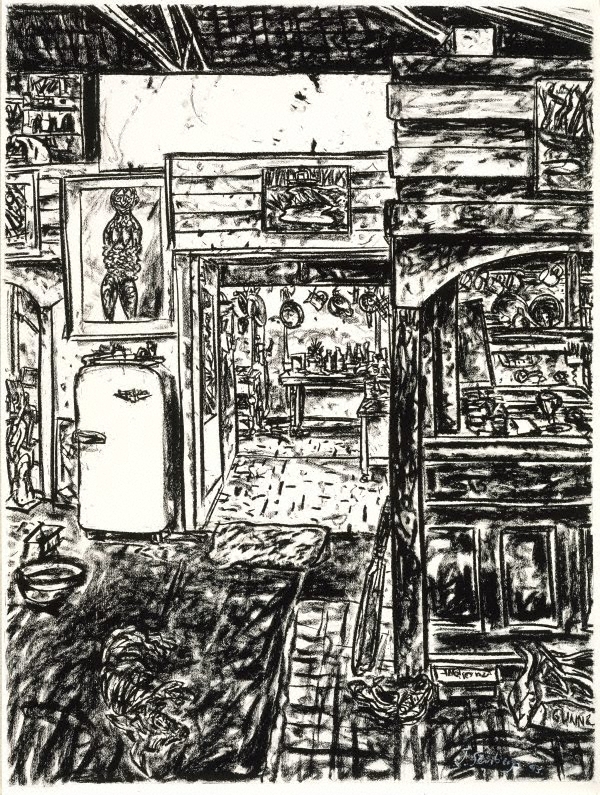 'Kitchen at Smacka’s' is a panoramic view of Senbergs’ studio, a cavernous space in inner Melbourne, occupied in the 1960s and 70s by a nightclub named after its owner, Smacka Fitzgibbon. The building was a prominent part of Melbourne’s jazz scene before Senbergs occupied it. In the first two sheets of the four-part drawing, the semi-circular dance floor can be seen, which Senbergs has retained; in the fourth sheet, the old bar is visible. Senbergs only submitted the third and fourth sheets of this quartet of drawings to the Dobell Prize. After it was acquired for the Gallery’s collection as the winning work, the artist gifted the first and second sheets of the quartet to the Gallery. A drawing of the interior of his previous studio in Middle Park, 'Studio interior' 1993, is also in the Gallery’s collection. Signed and dated l.r. corner of right hand sheet, white pastel "J Senbergs 95". Hendrik Kolenberg, Contemporary Australian Drawing: 20 years of the Dobell Prize for Drawing , ‘Introduction’, pg. 6-14, Sydney, 2012, 7, 24, 25 (illus. ), 60. Hendrik Kolenberg, Look , ‘Drawing conclusions’, pg. 17, Sydney, Sep 2006, 17. Hendrik Kolenberg, The Dobell Prize for Drawing: 1993-2004 , ‘Introduction: the first ten years’, pg. 8-9, Sydney, 2004, 9, 20, (illus. ), 21 (illus. ), 50, 51. Hendrik Kolenberg, Look , 'A fine harvest of drawings: legacy of an exceptional draughtsman', pg. 28-31, Sydney, Nov 2011, 30. Hendrik Kolenberg, Look , 'Drawing a winner: a decade of Dobell prizes shows us how and why', pg. 24-27, Sydney, Aug 2003, 26, 27 (illus.). John MacDonald, The Sydney Morning Herald , ‘Few mutterings but work a winning choice’, pg. 12, Sydney, 08 Apr 1995, 12 (illus.). Patrick McCaughey, Voyage and landfall: the art of Jan Senbergs , ‘The studio and the dangerous world 1991-1994’, pg. 159-188, Carlton, 2006, 178-181 (illus.). Bronwyn Watson, Look , 'Prize drawings: building a collection by competition', pg. 24-26, Melbourne, Oct 2001, 26 (illus.). Judith Wright, Look , 'Drawing at its best', pg. 15, Melbourne, Mar 1999, 15 (illus. ).